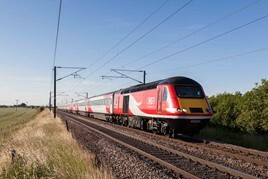 London North Eastern Railway Managing Director David Horne has declared that it is “business as usual” on the East Coast Main Line, following the transfer of services to the new operator from the now-defunct Virgin Trains East Coast on June 24. The first LNER-branded train left King’s Cross for Edinburgh at 0754 on June 25 (yesterday), marking the return to the network of the iconic company name for the first time since nationalisation of the railways in 1948. Synonymous with the high-speed exploits of famous steam locomotives including Flying Scotsman and Mallard, the latest incarnation of LNER will embody the same ethos of offering higher standards of customer service and improved connectivity, said Horne. This will begin with the introduction later this year of a fleet of 65 new Intercity Express Programme Azuma trains that are currently on order from Hitachi. Horne confirmed to RAIL that the first Azuma will enter service as originally planned by VTEC, in December on the King’s Cross-Leeds route. LNER has also retained VTEC’s timetable uplift and station upgrade plans. He said: “LNER is an iconic brand for this route and the regions it serves. People associate great things with the brand from a historical point of view, and it symbolises a great time for the ECML. It was also a company that was pushing the boundaries in speed and comfort, which is exactly what we’re going to be about going forward with the new trains. “We’re still working to the same plan for the new trains, and Hitachi tells us that we will get the first one delivered in November. We have started driver training and everything is geared towards December." To read about Chris Grayling's decision regarding LNER, read RAIL 853, available available digitally on Android/iPad. To read about how public ownership was an option for Government, read RAIL 846, available digitally on Android/iPad.